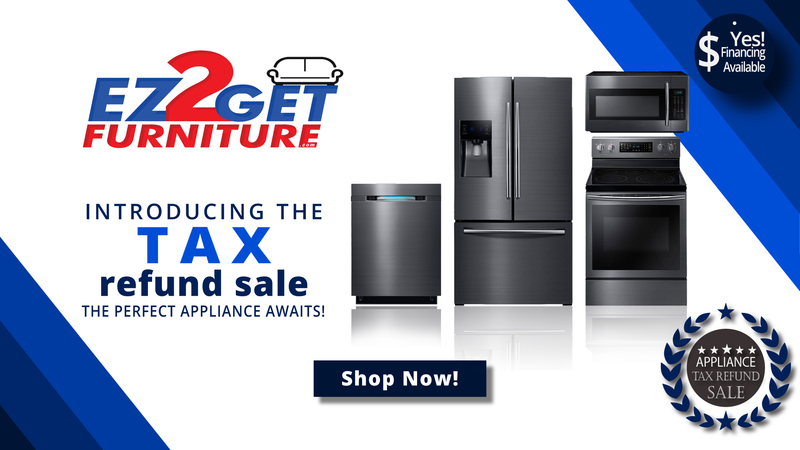 Home > Tax Refund Sale!! Our tax season sale is here! For a limited time, we will be offering great Long Angeles furniture deals so that you can redo your home without breaking the bank! This sleek deep dark espresso platform bed features a platform unit upholstered in faux leather for a contemporary décor. Its simple craft is complimented by a wood black finished night stand, mirror and dresser set. HB 37", FB 13"H . Choose your color Brown or Grey . Sleep Sensation Mattress Included. Dine in true French fashion with this metal frame dining table and chair set that features a round table with a faux marble center with wood trim. The circled pattern of faux marble and wood trim is continued in the chair design. - 45" DIA. With safety in mind, this twin over full bunk bed will also create a fun and inviting bedroom atmosphere for your little one. Full length guard rails offer security, while the built in ladders on each side provide convenience. High gloss finish in red allow you to choose the perfect look for your child's individual style. 78"L x 54" W x 60" H. Mattresses sold separately. The fun space saving design of this twin bunk bed will make a wonderful addition to your child's bedroom. Built-in ladders on each side offer convenience, while full length guard rails provide security. The black high gloss finish allows you to create the perfect look for your child's room. 78" L x 41" W x 60" H. Combo Mattresses Included. Available colors: Red, Black, Blue and White. Excite your child with this twin wood bed in a cherry wood finish. It also includes a trundle bed perfect for sleepovers. Perfect for your breakfast nook or entertainment space, this rich cappuccino finish dining set features a round top with drop down extension and padded fabric seats. 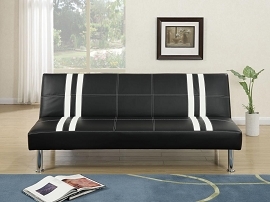 This stylish sofa bed will be a welcome addition to your home. This piece will help you make the most of your space, with a great multi-functional use that is perfect for condos, small homes, or a spare bedroom. By day, enjoy lounging on the plush tufted seat and back. A built-in middle drop down console offers a convenient spot to set remotes or snacks. Constructed of a kiln dried hardwood frame, sinuous spring base and wood tapered legs, this sofa will bring comfort and durability to your home entertainment space. Covered in a tan microfiber and dark brown vinyl, the two tone look adds a gorgeous modern design. Drop the back cushion to easily convert this comfy sofa into a double bed for when family or guests stay the night. 69.25" L, 35.5" H, 36.25" W.
Fusing the contemporary and classic design with this collection of 4-piece modular sectionals covered in soft linen. With plush seating and back support, each piece is accented with asymmetrical tufting and stitching to enhance your living space. Compliment the sectional with accent pillows and a matching cocktail ottoman. LAF one-arm loveseat 52" x 32" x 35" H ; corner wedge 32" x 32" x 35" H ; Ottoman: 23" x 28 x 19" H. Ottoman or coffee tables are not included. Come home to this 2-piece sofa set crafted in simplicity. Each piece is upholstered in a linen-like cushioned fabric with asymmetric tufting and light accent stitching. Adorn your seating with accent pillows for added flair. Sofa 71" x 32" x 36" H, Loveseat 58" x 32" x 36" H. Comes in box, Light assembly required. Refine and define your style with this 2-piece sofa set that includes a loveseat and sofa. Take lounging in style to another level with furnishings upholstered in a linen-like fabric with light accent stitching and cushioned back and seating. Chevron patterned accent pillows modernize the decor this collection. Sofa: 80" x 32" x 36" H, Loveseat: 58" x 32" x 36" H.
Our ash and white faux leather like futon is the perfect piece of furniture for any room with style. 72" x 34" W x 30" H (up), 72" x 40 W x 14" H (flat). This is a bedroom collection for the intriguing. 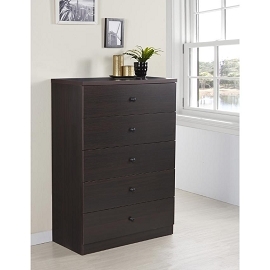 With its tall black faux leather headboard being the main attraction, this striking bedroom set’s design includes storage units accented with drawers with curves and lines making it the essential avant-garde decor for any bedroom. Bed Headboard 52"H, Nightstand: 26" x 17" x 26"H, Dresser 59" x 17" x 41"H, Mirror 39" x 35"H. Mattress and chest sold separately. Includes: bed frame, 1 night stand, dresser/mirror. The Bookcase headboard is wonderful for keeping books, framed photos and other personal items while the lower drawers have plenty of storage space. Bed room set includes: Twin Chest Bed 85" L x 40" W x 44" H, Dresser/ Mirror 64"L x 17" W x 32" H, Night Stand 26" L x 15" W x 23" H, Chest 36" L x 17" W x 49" H. Mattress Sold Separately. The unique styling of the Pasadena collection offers a casual contemporary look that’s sure to make a bold statement in your bedroom. Bed set includes: Queen Panel Head board 63 L x 1.5" W x 45" H, Dresser/ Mirror 64"L x 17" W x 32" H, Night Stand 26" L x 15" W x 23" H, Chest 36" L x 17" W x 49" H. mattress/ box spring and bed frame included. Complete your bedroom with our new Aspen collection group in a grey color. Bed-frame only comes in a queen size. Dresser/ mirror, night stand, chest and Mattress sold separately. Queen Bed Frame 88"L x 63" W x 58" H, Dresser/ Mirror 64"L x 17" W x 32" H, Night Stand 26" L x 15" W x 23" H, Chest 36" L x 17" W x 49" H.